Find out everything you need to know about the heroic team of cosmic adventurers with Marvel Guardians of the Galaxy: The Ultimate Guide to the Cosmic Outlaws. This comprehensive guide celebrates the exciting world of Marvel's Guardians of the Galaxy, with a decade-by-decade history that charts all the incarnations of the group. 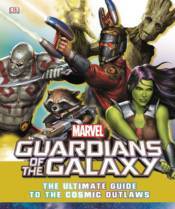 The book examines iconic characters like Groot and Star-Lord, showcases key comic book issues, and explores important storylines. Packed with information on allies, enemies, locations, and much more, this book is a must-have for fans of Marvel comics.